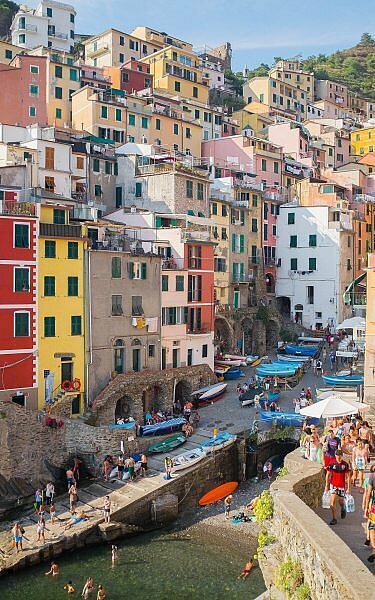 The hidden gem of Cinque Terre is Italy’s worst kept secret. It’s a mere 3-hour train ride from Milan or Florence to Cinque Terre, making it the perfect weekend break in Northern Italy. Cinque Terre is Italian for “five lands” and refers to the five coastal fishing villages located on the Mediterranean Sea. From north to south, they are Monterosso al Mare, Vernazza, Corniglia, Manarola and Riomaggiore. They were collectively recognized as a UNESCO World Heritage Site in 1997. The great location is not all. 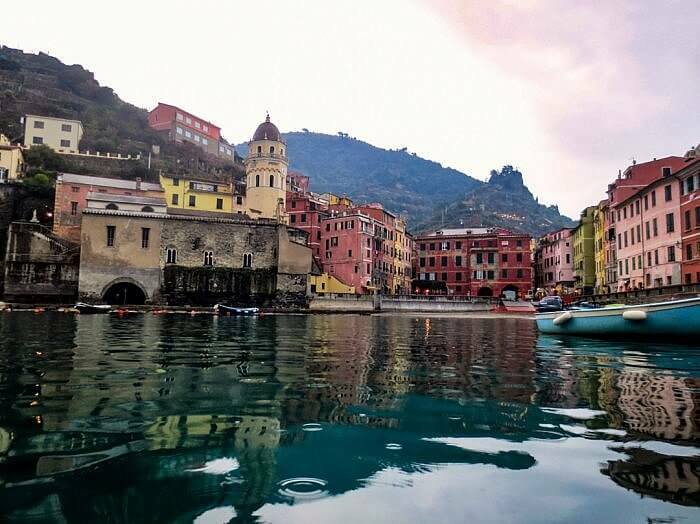 It’s no surprise that the first photo of Italy displayed on Google Images is of Vernazza. The crystal clear water, colorful houses sculpted directly out of the cliffs, lively town squares and coastal paths between the villages all contribute to making this the gem of the Italian Riviera. Here’s what you can see along the five lands route. Do you like relaxing on a white sand beach by a picturesque Italian town of colorful homes surrounded by green terraced hills? 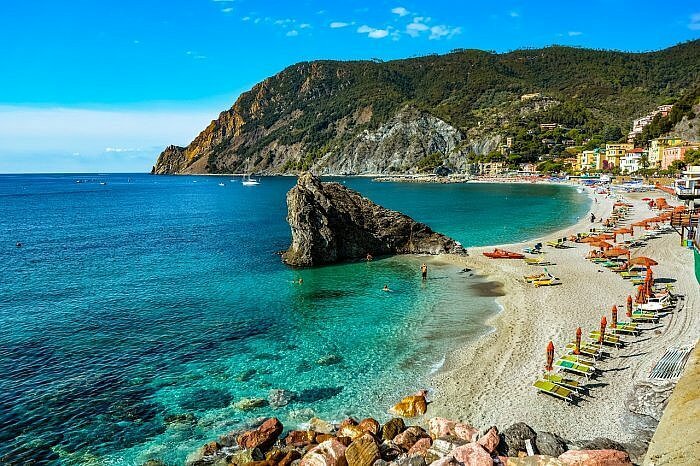 Then Monterosso al Mare is your village. Beside the beach is the Monterosso Giant, a 44-foot-high statue of Neptune built into the terrace of the villa behind it. The statue was damaged in a bombing during World War II, and again in a storm in 1966, but still makes a fantastic background to the beach. Three structures in town are definitely worth visiting. The first is the partially-ruined castle built by the Genoese. The second is the church of St. John the Baptist with its beautiful marble columns and medieval bell tower. Finally, there’s the convent of Monterosso al Mare, filled with artwork and historic artifacts such as a Crucifixion painting attributed to Anthony van Dyck. Are you a fan of pesto lasagna? The small restaurant hewn out of the cliff face down by the harbor serves homemade pesto lasagna. Make sure you enjoy it with a glass of wine from the local vineyard. Vernazza has similar structures to Monterosso, including Doria Castle, the Sanctuary of Madonna di Reggio, the Church of Santa Margherita d’Antiochia and the Chapel of Santa Marta. Make sure to get the best photo of the town from the pier in the harbor. Speaking of that small restaurant, I had a particularly wonderful experience with them. Wanting to have more of the amazing lasagna, I asked the proprietor for the recipe, thinking there was no way he would give it to me. I was surprised when he did, but what was more surprising is that he only named five ingredients! Instead of cooking the food at the restaurant, his mother cooked at her house nearby and brought the food for the patrons. Hence, true home cooking. When I commented it was the best pesto lasagna I’d ever had, he was quick to offer seconds. I accepted! 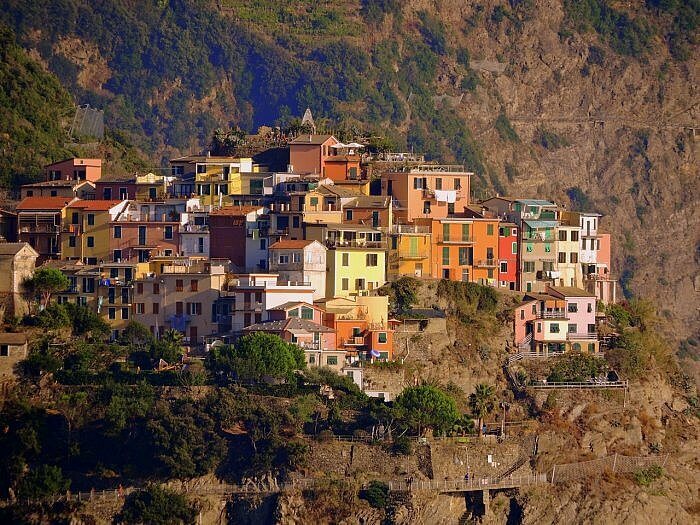 Corniglia is the only village not directly on the sea. Instead, you have to climb 382 steps up a 328-foot cliff to this small village of only 120 inhabitants. There’s not a lot to do here beyond enjoying the view, although you’ll have to stop by the Church of San Pietro. Do you like snorkeling? Manarola, the oldest of the five, has some of the best deep-water swimming conditions in the region. When you’ve dried off, make sure you try some fish from the local fishermen – these are coastal fishing villages after all. The town possibly gets its name from the old watermill which you can visit, and make sure you don’t pass up the Church of San Lorenzo. If you happen to be visiting during Christmas time, Manarola hosts the world’s largest nativity scene! Do you like hiking? 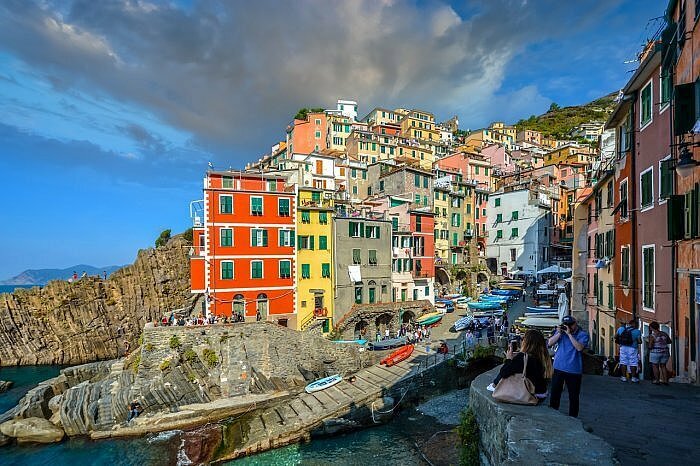 Riomaggiore is the southern-most village, straddling the mouth of a river it was named after. At the top of the village, you can visit the San Giovanni Battista with its black and white designs. Farther into the hills, you can visit the Sanctuary of Madonna di Montenero. 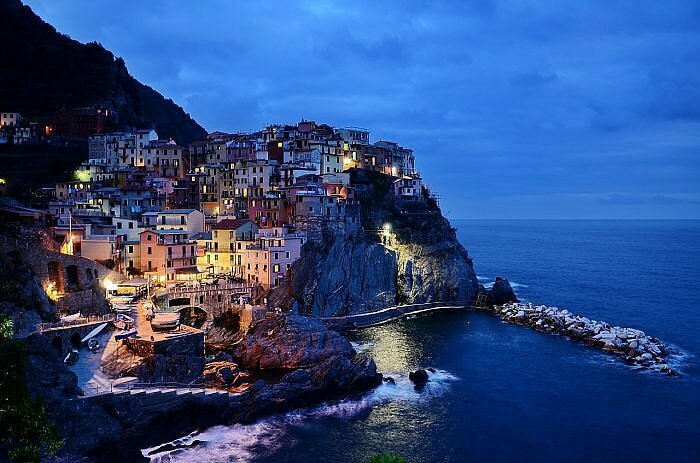 In the other direction, you can take the Via dell’Amore, or “Way of Love,” to Manarola. The famous street overlooks the sea, although it’s currently undergoing repairs due to a landslide. If traveling by train from Florence to Cinque Terre, it’s an hour ride to Pisa and another hour to La Spezia. From there, take a third train to whichever Cinque Terre village you want to visit first. Riomaggiore is the closest and only a few minutes from La Spezia. Insider tip: book your train tickets for each leg of the journey separately instead of as one ticket to save money. The trains run roughly every half an hour. If you’re planning to drive, consider parking in La Spezia and take the train to the villages. The roads to the villages are small and there isn’t a lot of parking, especially in the summer months. There are trains running straight from Milan to Cinque Terre. The ride is about three hours long and leaves once an hour. Follow the above directions to get from La Spezia to the individual villages.